The ranks of bicycle commuters are growing, though men are almost three times more likely than women to ride to work. Brian McKenzie, a sociologist with the U.S. Census Bureau, says most people still depend on their cars to get to work. But the bureau's first ever survey of people biking or walking to work, Modes Less Traveled, does show some change. "We see that biking [to work] has actually increased over the last decade by about 60 percent," McKenzie says. "Just over three-quarters of a million people bike to work." The Census Bureau took city population into account in its analysis. Among small cities, Davis, Calif., topped the list at about 19 percent of workers, encouraged by the college town's large bike community and infrastructure. The same is true for medium-sized Boulder, Colo., where about 11 percent of workers bike to their jobs. Portland, Ore., had the most of larger cities, about 6 percent. And in Chicago, which has new bike lanes and a bike share program, the bike commuter rate more than doubled, to about 1.5 percent. In many Southern cities, though, ridership is low. "Weather might have something to do with it," McKenzie says. "The fact that a good portion of Southern cities were built around the automobile might have something else to do with it." The Census also found that workers with the highest rates of bicycle commuting have incomes of less than $10,000 per year or hold graduate or professional degrees. And when it comes to gender, men are nearly three times more likely than women to use a bicycle to get back and forth to work. Chicago resident Rebecca Roberts says she rides more than 8 miles to her job at a nonprofit. She says she sees plenty of female riders, but she understands that some might worry about biking and how they dress for work. "I'm in my jeans today, but usually I ride in a skirt," Roberts says. "I have a commuting bike. I can usually keep coffee on the front of it, and I just feel like it's a better way to get there." And there's another factor that might put the break on bike commuting: fear of traffic and motorists, says Brian Knowles, a project manager who rides to work about four days a week. "But in Chicago, I think it's really ... a pretty bicycle-friendly city. We've got great roads like this where you've got bike lanes," he says. "Just get out there and do it." We're going to end this week with National Bike to Work Day, that's tomorrow. America is not as bike friendly as, say, Holland or Denmark where roads sometimes look like bicycle highways as so many people pedal to and from work. But the number of bicycle commuters in the U.S. has steadily grown over the last decade. CHERYL CORLEY, BYLINE: Sheridan Road is a busy street in Chicago and it's also the start of the Lakefront Bike Trail, on the north side. And that's where you can find plenty of bicyclists commuting to work early in the morning. LOUISE GRAHAM: I'm one of those year round warriors. GRAHAM: Yeah, unless the weather is really bad. CORLEY: Louise Graham is among a steady stream of backpack-wearing bicyclists getting on the path. Graham works in sales downtown and travels about 20 miles to and from her job; the same for David Michaels, who works at a digital marketing firm, and rides four to five days a week. CORLEY: And also a lot cheaper than driving, say most of the bikers. Brian McKenzie, a sociologist with the U.S. Census Bureau, says yes, most people still depend on their cars to get to their jobs. But the Bureau's first-ever survey of people biking or walking to work, called Modes Less Traveled, does show some change. BRIAN MCKENZIE: And we see that biking has actually increased over the last decade by about 60 percent in terms of the number of people who bike to work, so just over three-quarters of a million people bike to work. CORLEY: McKenzie says the bureau looked at the population of cities for its analysis. MCKENZIE: And among small cities, Davis, California topped the list at about 19 percent. MCKENZIE: And then among larger cities, Portland, Oregon topped the list at about six percent. CORLEY: Chicago's bicycle commuter rate more than doubled to about one and a half percent - credit lots of new bike lanes and a bike sharing program. McKenzie says in many Southern cities, though, ridership is low. MCKENZIE: Weather might have something to with it, probably the fact that a good portion of Southern cities were built around the automobile. 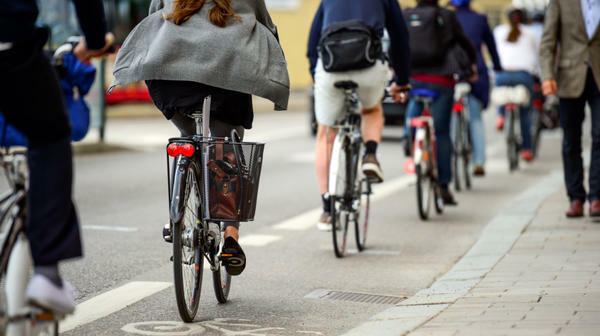 CORLEY: The census also found workers with the highest rates of using bicycles to commute to their job, either have incomes of less than $10,000 or they hold graduate or professional degrees. And when it comes to gender, men are nearly three times more likely than women to use a bicycle to get back and forth to work. CORLEY: Back near Chicago's Lakefront Path, Rebecca Roberts, who rides eight and a half miles to her job, in a non-profit's finance department, says she sees plenty of women riding. However she understands some might worry about biking and how they dress for work. REBECCA ROBERTS: I'm in my jeans today, but usually I ride in a skirt. And I just say, you know, I have a commuting bike. I can usually keep coffee on the front of it and I just feel like it's a better way to get there. CORLEY: But there's another factor that might put the brakes on bike commuting. Brian Knowles a project manager who rides to work about four days a week, says its fear. BRIAN KNOWLES: The fear of traffic and motorists. But, you know, in Chicago I think it's really a pretty bicycle-friendly city. They've got great roads like this where they've got bike lanes, so just get out there and do it. CORLEY: And with that, time to hop on my bike and get to work.